Talking with James Hillard of Horse Meat Disco prior to his crew’s debut visit to Chicago (the full spoils of that conversation will be added to the blog early next week), I let him know that he’d feel right at home at Stardust, Berlin’s edgiest weekday club night (musically at least). Regularly Scott Cramer and his team of party starters deck the bar out based on various themes (Super Mario Brothers, space adventures and game shows to name a few) and the night never goes down without someone running around in a costume of some sort. 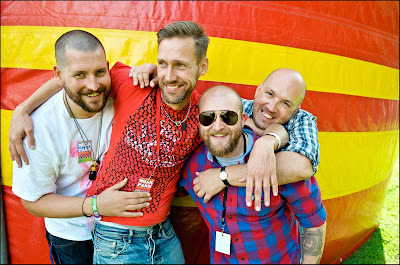 The same can be said of Horse Meat Disco’s party in London, so I knew Hillard and Jim Stanton—the chosen two of the the DJ foursome on this leg of their U.S. tour—would immediately click with the crowd. Sure enough, last night the freak flags were flying high by the time the Horse Meat duo took to the booth. Stardust was celebrating its second anniversary so the place was done up with red balloons, confetti and a few toy horses deviously positioned to mock doing it “horsey style.” Girls were running around in a rainbow’s array of wigs, shirtless dudes were making out at the bar and a trio—one dressed as a horse, another dressed as meat and a third dressed as a disco ball—posed for pictures at the Glitter Guts photo booth. It took Hillard and Stanton a few second longer than it should for the costumes in their honor to sink in. It was only after I pointed out the group was out of order—disco, meat, horse—that they clued in, giving us all a good laugh. All this mayhem took place along the edges of the bar, the dance floor reserved for serious moving and shaking. Disco young gun Kid Color had people boogying from early on, blazing a trail through all the right loft anthems before Clique Talk took to the stage with a live performance of angsty dance-punk. Chrissy Murderbot also impressed with a mix of Detroit and Chicago classics; a DJ set with a bit of a history lesson in it. Then it was time for the boys from London to get things properly riled. Tagging in and out every few songs, Hillard and Stanton had the place burning up as they sifted through Italo, disco, boogie, house and even a carefully chosen rock song or two. Inspired by the soundtrack, my buddy and I felt the need to raise a little ruckus ourselves. Between bouts on the dance floor and frequent trips to the bar, we decided that our British guests were too serene in the DJ booth. Four rounds of Jäger shots later and the mood in the DJ booth may have been more chaotic than that of the rest of the bar. I barely recall getting home, but I still woke up knowing last night was one to remember. Plaza | "(Got My) Dancing Shoes" (192 mp3) -- From Horse Meat Disco's first disco mix for Strut Records.